Adorable! What fun--can't wait to see him and read about the mischief he and ZuZu get up to. 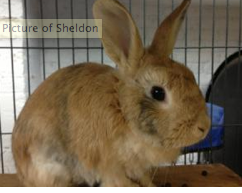 Why, what's wrong with the Sheldon? I was trying to think of floral related names for a boy last night. Not easy. Sheldon and ZuZu - works for me! He is adorable. We had a similar little brown rabbit as children - Roger Rabbit, as I recall. He was a delightful little fellow. Enjoy! Yay! Now I can forget about where spring went and concentrate on Narcissus?